In Indonesia, herbal medicine is known as jamu. 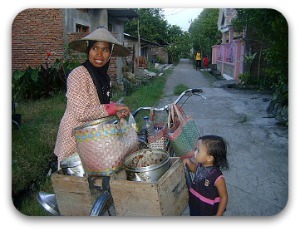 Jamu has a long tradition going back centuries. Jamu is very popular in any large city in Indonesia you can find street hawkers selling jamu; additionally there is factory production on a large scale. The video on the right is in Arabic and shows jamu being made. Before the late 1930's physicians were not all that interested in jamu. The doctors thought that the western knowledge of medicine was much better compared to so call primitive eastern beliefs which they believed to be based on superstition. In the late 1930's Indonesian physicians changed their attitude. Numerous physicians including Seno Sastroamijoyo and Abdul Rasyid realized it would be impossible to provide proper healthcare to the population if it were based on the western model of healthcare. They supported the usage of jamu over expensive imported western pharmaceuticals. At the Association of Indonesian Physicians conference in 1930, two traditional healers were asked to give demonstrations. Physicians at the conference were surprised and interested and to learn about Indonesian herbal medicine, as they did not know much about it. During the Japanese occupation, the use of jamu was again encouraged when western medications were in short supply. The Indonesian government is now promoting the use of herbal medicines as a complementary medicine to modern medication. Doctors sent to the clinics are given training and education on herbal medicine. On completion of the course the doctors will receive certification which will allow them to give herbal medication prescriptions to their patients. Hope you enjoyed this page on doctors prescribe herbal medicine in Indonesia. You may also enjoy a prescription for natural healing.